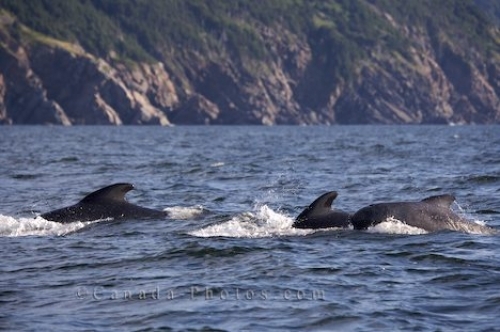 Long-Finned Pilot Whales are not actually whales at all but belong to the dolphin family just like a Killer Whale. These whales are very social mammals and have very round distinctive foreheads which makes them easy to recognize in the wild. Enjoy a whale watching adventure from Pleasant Bay in Cape Breton, Nova Scotia and see these whales in their natural environment. Picture of a small pod of Long Finned Pilot Whales surfacing in the Gulf of St. Lawrence in Cape Breton, Nova Scotia in Canada.